Business runs on content and that content must be managed holistically, across the entire business. 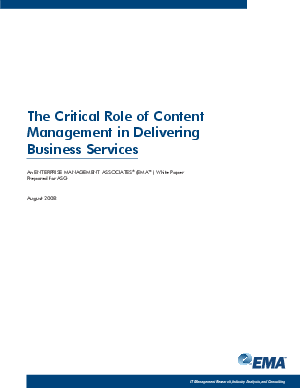 However, managing content is, in itself, not enough to drive business. Enterprises must incorporate ECM with other IT management systems to provide complete Business Service Management (BSM). This EMA white paper investigates these issues in more depth and provides an overview of how ASG is bringing together technologies for ECM and BSM to address business-aligned content management initiatives across the enterprise.